Bellsuz wrote: I asked my sister if he came back, she looked me straight in the eye and said, "Nope." Believe me, when I got to the part when he was back, I called her and gave her a piece of my mind! Have to admit, I did something like that to my friend. She called me when she was reading the part where Bella threw up the chicken and demanded "can vampires have babies?" Does that sound crazy?? Oh well!! I swear, when my sister told me Edward didn't come back I was so close to writing off Twilight and all it's glory! 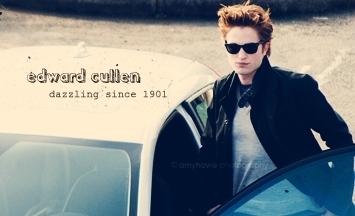 There can be no Twilight without Edward!! Definitely no Twilight without Edward. These books are obviously jammed full of these moments! A little rambling first. I am team Edward...but I totally like Jacob. If you read the thing that SM has on her website about how Jacob is actually feeling...it is easier to learn to love him. I think the relationship b/w Jacob and Bella is wonderful mostly because it helped them both through really hard times in their lives. Yes I wish she would not have kissed him back! But like SM said the fact that she acknowledges that she is in love with Jake....but yet NEVER doubts that she wants to be with Edward really proves how much more intense her love and bond is with Edward. Okay so thankfully by the end of BD you (well I don't anyway) hate Jacob....in fact I grew to admire and love him. Now that all my silly rambling is out....let me present a very simple moment that literally caused me to put my book down and CRY! Just typing it grabbed my heart! I love how it all came full circle! For me personally the most heart stopping moment was when Bella and Jacob kissed in the forest before the fight with the Newborns in Eclipse. I am Team Edward and that moment made my heart sink. I mean I like Jacob too but I just couldn't help thinking that Edward was going to walk through the trees at any moment and see them kissing . peacelovetwilight wrote: For me personally the most heart stopping moment was when Bella and Jacob kissed in the forest before the fight with the Newborns in Eclipse. I know how you feel (see a couple of posts back about my "cheating" experience. I felt bad about it, but like I said, I couldn't take the pressure of not knowing. Oh...I just thought of another one. My stomach sank and heart ached after the night in the tent with Edward/Bella/Jacob. When Jacob realizes that Bella and Edward are engaged he howls in wolf form. My heart breaks for him! I am totally team Edward but I have a soft spot for Jacob too and when he overhears them that morning its pretty heartbreaking! Well, I love all the books, but I think my favorite is New Moon. I mean, it brings you from a high to the lowest possible low and then to the highest of highs again. I didn't cry when Edward left, but that hole that Bella describes was in my heart and chest as well. I seriously couldn't take a deep breath. And, I did have to skip ahead just to see if he returned and I've never had to do that on any book before that. I didn't enjoy it the first time I read it, well, that's not true. I did enjoy it, but it was a rushed enjoyment and I let virtually nothing sink in. I've read it several times since and have come to really appreciate it. But, as far as heart stopping goes...when Edward does come back in New Moon and says, "I'm a good liar, Bella, I have to be." Oh my dear goodness. I just knew he was going to tell her how much he loved her and I just couldn't read it fast enough. one for me was definitely when Bella was figuring out that she was pregnant. I was like what the?! how does that happen? definitely didn't expect it & so I had to keep reading to find out what was goin on. and then when Bella had Renesmee and Edward was fighting to save her life it was so frustrating because it was from Jacob's pov and after he left the room we didn't know what was going on & how was Edward doing in saving Bella? since there was still what half the book left I knew she must have been okay but it was still nerve-wracking waiting to get to the point where we find out what happened and Bella is okay & her baby is okay. there are more (especially in BD) but those are the two that came to my mind right away.